Give raw meat to his dog? The dog is a carnivore and ate meat in the wild. It has teeth designed for tearing and crushing, powerful jaws, a small stomach very muscular, short intestines (to avoid putrefaction of fresh meat), and above all powerful digestive juices that dissolve massive bones. Why give raw meat to his dog? Present in the mouth and stomach, these acids are highly antiseptic and can even digest the flesh of an animal patient without side effects. But unlike the herbivores that can swallow enormous quantities of food, the little dog’s stomach can only receive reduced amounts. Consequently, the general rule is to give small rations of food concentrates, including raw meat tops the list. Distributed block with bones, it operated at full capacity the stomach and digestive juices, the intestines, jaws and teeth. If food is substituted for another, there is a decline of carnivore digestive organs. The meat shall be 75% of the diet. Following a well-fed herbivorous (green grass, whole grains, spring water …), it is a highly concentrated food. It contains the cellulose of plants ingested as dogs can digest only with difficulty and in small quantities in raw, processed and easily digestible protein. The animal flushes out the meat eaten in 8 hours. Meat should always be given raw, otherwise it loses its benefits, such as pasteurized milk and long life elsewhere. Heating (cooking, pasteurization) kills some of the right nutrients. According to Juliet Baïracli Levy, cooked meat has deleterious effects on the dog’s digestive system: unpleasant body odor, bad breath, tartar deposits, premature aging (kidney problems, vision problems and hearing), and even worms! Rabbits and hares fed whole and still warm. The hair and skin protect the dog’s digestive system perforation by sharp bones. They even have laxative properties … If you buy a rabbit already stripped, dip it in boiling water to restore elasticity. Add wheat bran or oatmeal to coat the bones. Adopt the same treatment for poultry. Mutton (with bones), the severed heads of two (eyes, brains), the cheek of beef (with bone). For breeds miniature prefer the rabbit and chicken. 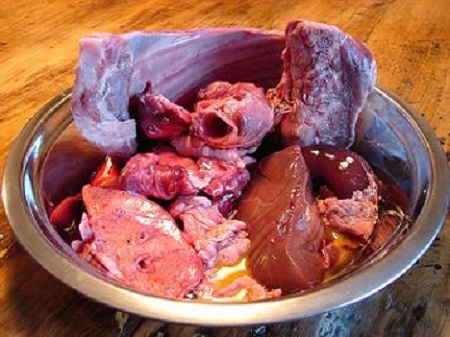 The guts of herbivores: the rumen raw unwashed (prohibited for sale in France), the intestines of rabbits and hares. While there is a risk of tapeworms , but the dog is raised to the Natural Rearing resistant and full health. Very popular with dogs, the guts of herbivores are a source of starch predigested and green herbs, but you should give only small amounts. Of prey, wild canids (coyotes, foxes …) eagerly seek them as well as eyes (vitamin A, iodine and phosphorus), liver and endocrine glands. The liver: dogs love this lamp containing many minerals and vitamins. Caution Apply only liver quality, from a healthy animal, preferably a farmer, because this organ can contain toxic substances if the battery was high or sick. The sheep liver is parasitized by a dangerous parasite fluke. Give it in small amounts because it can trigger diarrhea (no more than twice a week). Guts and throat: If they are raw, fresh and tender. To cut into small pieces. Chicken feet and soft bones are an excellent source of calcium. Given raw bones are the toothbrush for dogs and cats. The exercise performed by the jaw strengthens and promotes a good length of muzzle. The bones are advised soft bones and dishes (ribs), but not the big hard bones filled with marrow, which damages teeth. The bones that break and / or small enough to be swallowed should be avoided (risk of fatal perforation). Yes to the half-sheep’s head (dogs like the brain). An old method to feed the Fox Terriers was to boil a sheep whole length before pouring the juice and meat of oatmeal. Do not give bones when the dog has an empty stomach. It is best to give the meat attached to bone.